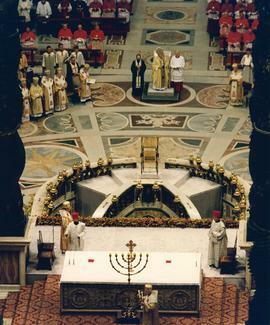 Metropolitan Michael Bzdel goes to Rome to celebrate the 400th anniversary of the Union of Brest, Rome, Italy, July 7, 1996. Pope John Paul II is on the right. 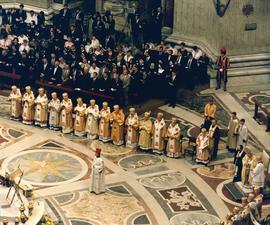 Canadian hierarchs at the 400th anniversary of the Union of Brest, Rome, Italy, July 7, 1996. From left to right: Bishop Mike Yakimyshyn, Bishop Roman Danylak, Metropolitan Michael Bzdel, Bishop Cornelius Pasichny, and Bishop Stefan Soroka.